Every Friday my hubby’s office group gets together to order lunch which the company pays for. It’s a great morale booster – can you imagine looking forward to a paid lunch every Friday? It would be a definite perk for me! Anyway, so this past Friday the boys ordered in some Chinese. There was loads of plain steamed rice leftover. My husband and I grew up with the “starving child in Africa” story – he actually knew some such kids – so he brought over the rice. Stage 1: I stir-fried all the veggies in hot oil tempered with garlic, ginger and onions. Zucchini and peppers first, mushrooms last. I didn’t add peas (didn’t feel like) or green onions (didn’t have any) although they would make good additions. Must crumble 1/2 the stock cube here along with soya sauce and hot sauce. Totally rounds out the flavour. I removed the veggies to another dish. Stage 2: Heated up some oil(s), added in some ginger/garlic, crumbled 1/4 stock cube and stir-fried my eggs and prawns until cooked through. Removed them to the veggie dish. Stage 3: Fried the cold rice in some oil(s), crumbled in the remaining 1/4 stock cube and heated the rice through. Added in the veggies, eggs and prawn mixture and stir-fried till well mixed. Finished with shredded cilantro leaves. 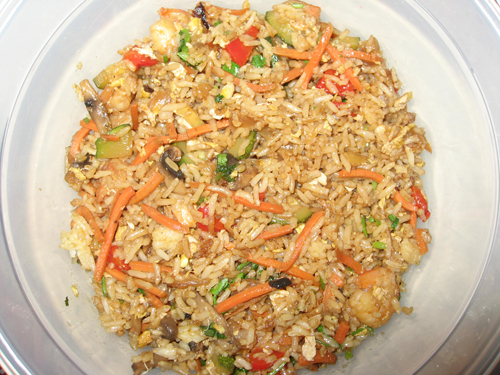 A yummy kitchen-sink rice dish.